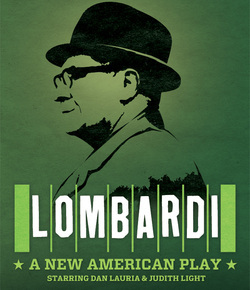 There are enough gratifying aspects to Lombardi to make it 90 minutes well spent. The (very thin) play by Eric Simonson, is based on a biography. I don’t know enough about sport to comment on the accuracy of the football history. (Let’s be frank, what I know of sport I learned from Damn Yankees.) There are beautiful moments in this play that are by no means the result of Thomas Kail’s (In The Heights, Brokeology) direction. Having now seen Lombardi and Brokeology I am left believing that Mr. Kail is adept at knowing his audience and creating a format that will appease. 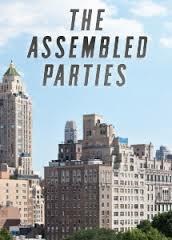 What he is not necessarily skilled at is helping his actors connect resulting in a complete lack of dramatic tension. But he does know his audience. This production, at Circle in The Square, is filled with lighting cues, videos and sound effects. But what a joy to see theatre in the round! While one of the actors (Keith Knobbs) seemed to have a bubble over his head reading “pivot, pivot, pivot,” most of the actors seemed entirely comfortable in the venue. Theatre in the round can be such a wonderful method of drawing the audience into the experience, and I do believe the format helped this production a great deal. It is difficult to asses performances when there simply isn’t that much with which to work, but there was one clear stand-out. Judith Light plays Vince Lombardi’s wife Marie and steals the show (I would use a football metaphor, but who are we kidding.) Ms Light while known predominately for her soap opera and sitcom work, is a very accomplished stage actress (Wit.) She owns the stage for every moment she is on. She manages to do so without any cheap tricks (which would be simply disastrous in such a small venue) but by the sheer force of her embodiment of her character. Dan Lauria plays her husband Vince, and from what people tell me, Mr. Lombardi was ferocious? I wouldn’t know that from Mr. Lauria’s performance. He was likable enough (which is probably not helpful for this role) but the stage is clearly not his home. I have decided that he was saving his voice (I saw a matinee) and I have no issue with that, however, he seemed to also be relying on his voice to do all the work for him. That can be a problem. Even so, how wonderful to see an un-miked play!! I was almost dizzy listening to sound actually change as actors moved! How novel. How wonderful. The size and style of the theatre, and the lack of amplification was joyous enough for this reviewer, but added into the equation was the fact that the majority of the audience were first time theatre goers. Now, this might have been the ONLY time they were to venture into a theatre, but that’s okay too. Much has been made of the website tutorials that existed for Lombardi fans (“it is customary to applaud for performances that please you.”) but I say “hurray.” Come to the theatre to see the football memorabilia in the lobby. Take photos of yourselves (in football regalia) next to full size Lombardi photos. Flip through the Playbill declaring, “I’d see the Blue Man Group in anything.” Come one, come all. There is a whole lot of things theatre should be (affordable, magical, etc.) but what it should never be is elitist. I think I lifted some of that from Herbie’s speech to the stage manager in Witchita’s only burlesque theatre.